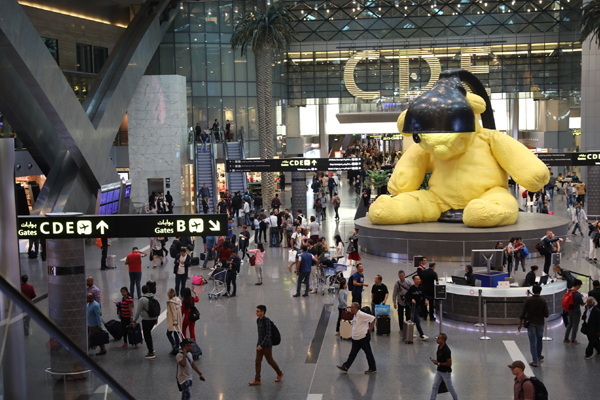 Qatar's Hamad International Airport (HIA) welcomed a total of 9.68 million passengers and handled 57,031 aircraft movements in the third quarter of 2018, making this the busiest quarter of the year so far. The airport also handled 538,551 tonnes of cargo in the third quarter of this year. The third quarter 2018 report revealed that HIA served 3,401,880 passengers in July, 3,459,518 passengers in August and 2,821,928 passengers in September, which includes passengers arriving, departing and transferring through HIA. The third quarter of 2018 also showed a 10.6 per cent increase in passenger traffic in comparison to Q3 2017, with August being the busiest month of the year so far. The airport also handled 19,064 aircraft movements in July, 19,228 movements in August and 18,739 movements in September, with August being the busiest month for aircraft movement in the year as well. This denotes a 15.2 per cent increase in the total number of aircraft taking off and landing at HIA compared to the same period in 2017. In addition, HIA handled 538,551 tonnes of cargo in Q3 2018, with 181,643 tonnes in July, 175,585 tonnes in August and 181,322 tonnes in September. The third quarter of 2018 demonstrates continuous growth for the airport, further positioning it as a leading hub worldwide. HIA has contributed its efforts towards investing in facilities, services, staff and the newest technologies to provide a world-class passenger experience to its travellers. Engineer Badr Mohammed Al Meer, chief operating officer at Hamad International Airport, commented: “HIA has demonstrated sustained and continued growth, experiencing the busiest quarter of 2018 so far. As a gateway to Qatar, we are committed to empowering travellers through hassle-free airport travel experience while also accommodating an increasing number of passengers. Our resilient operations, investment on cutting edge technology, and ambitious team had put HIA ahead of the curve in shaping the future of passenger experience." As Qatar gears up to welcome thousands of visitors during the Fifa World Cup 2022, HIA is preparing to boost the airport’s capacity which will eventually accommodate more than 50 million passengers per year by 2022. HIA is also working hand-in-hand with the Supreme Committee for Delivery and Legacy to process the smooth arrival of visitors for the World Cup.